Our Infant Program welcomes children aged 6 weeks to 18 months, with a maximum group size of 10 children. 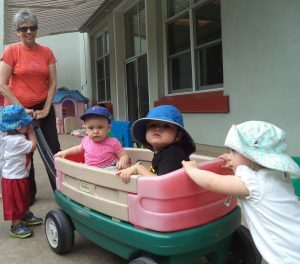 Our program focuses on valuing and enhancing the unique needs and developmental skills of each infant in a warm, loving and nurturing environment. The infants are on their own daily schedules as outlined by their parents and we ask that parents provide all food, milk or formula, diapers, clothing, etc. The infants enjoy a wide variety of activities each day, aiming at developing both their small and large muscles and thinking abilities. 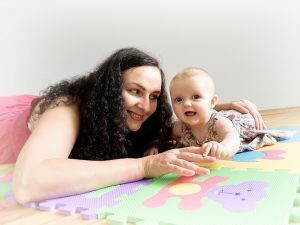 Our Educators have a wealth of experience working with infants and young children; every day they observe our infants, watching for development milestones, emerging skills and encouraging their development. We appreciate how difficult it can be for parents to leave their child with us, which is why we’ve created a process that takes into account the needs of both the parents and the infant and integrates your child into the program in a gradual way. Play is more than just “fun” for infants. It’s how they learn. Play is essentially a child’s “work” and helps their brains grow while also being a lot of fun. 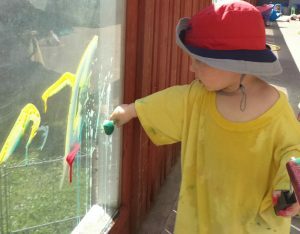 Our infants enjoy a wide variety of activities each day. We plan with purpose to provide meaningful experiences. We reflect on what we observe the children doing with their environment and peers. All the infants exercise their large muscles crawling, cruising, walking, climbing and sliding. Our infants experience the fun of getting messy with sensory play materials such as sand, water, and goop. The infants work their thinking abilities as they explore connecting beads and blocks, puzzles and pop-up toys. In our program, we follow How Does Learning Happen? Ontario’s Pedagogy for the Early Years and the Ontario government’s early learning framework, ELECT (Early Learning for Every Child Today). Our infants enjoy a wide variety of activities each day. They have the opportunity to enjoy stories and songs. 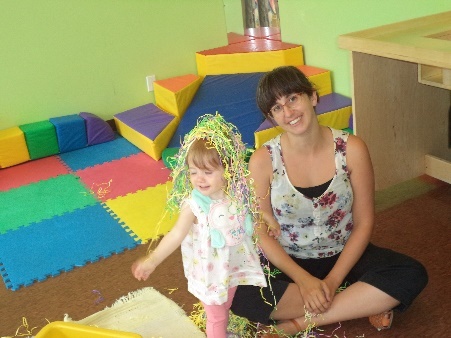 They experience the fun of getting messy with sensory play materials such as sand, water, and goop. Watch for the wonderful artistic creations that are created as the infants experiment with paint, crayons, and glue. The infants exercise their large muscles crawling, cruising, walking, climbing and sliding. They work both their fine muscles and their thinking abilities as they explore connecting beads and blocks, puzzles and pop-up toys and so much more. Their language and grasp of concepts grows even faster than their bodies! In our changing area, you will find a labelled bin for your child’s diapers, wipes, creams, sunscreen, and extra clothes. Extra pants, shorts, shirts, and even socks are often needed. Any soiled items will be bagged and placed in your child’s cubby. We ask that you please check your child’s bin regularly to ensure that there is a sufficient supply of diapers and wipes and that the clothing still fits – our infants grow quickly! Parents are responsible for providing all the food and bottles that their child might need during their stay with us. We follow the guidelines you provide when you outline your infants’ typical daily schedule and as we all get to know each other the infants are fed when they want to be fed. Once the children are no longer eating baby food, then they can enjoy the morning snack provided by the Mothercraft kitchen. We ask that food/bottles are in clearly labelled containers. The Public Health Department expects that parents will include an ice pack in their child’s “lunch bag” during travel time from home to daycare. We have all the dishes and cutlery needed to serve your child. It doesn’t hurt to pack a little bit extra food or an extra bottle just in case it is needed. In the fridge in our kitchen, food bins are labelled with each child’s name. Lunch and snack foods are placed in your child’s bin when you arrive and emptied completely before you leave. All bins are washed and disinfected daily. The Educators discuss the children’s sleeping needs on a daily basis to establish the sleeping groups. One Educator will bring the children with similar sleep times into the sleep room. Napping groups typically consist of morning, mid-day, and afternoon time frames. Sometimes when a child is transitioning into the program it might be difficult for him/her to fall asleep when and how they do at home. The Educator will try to follow your guidelines but if the child is not able to sleep after 15 to 20 minutes we will take the child back to the play room and we will try again later. Sleeping in a different place can be hard to adjust to and we will soothe your child to sleep in his/her crib when he/she seems tired or at his/her next scheduled nap time. In some very rare circumstances a child won’t sleep in a crib. After all other methods have been exhausted and the child is unhappy because they are sleepy we might decide to have the child sleep in a stroller for that day. If this method is used the Educator will then communicate with the parents to discuss how to proceed for the next day the child is in the program. The important thing is that they get the sleep they need that day. *Please note that these sleep times are a guide only and daily discussion with parents and observations from staff are always considered. Based on the written information you provide, your child will join the sleep room with their group. The Educator stays in the sleep room and either your child will fall asleep on their own or they might need some comforting assistance. We supply sheets and blankets for all our cribs. However, if your child has a favourite blanket or sleep toy, please feel free to send it. We want sleep time to be a positive experience for your child. We understand that infant’s sleep needs might change based on their morning wake up times or other factors. 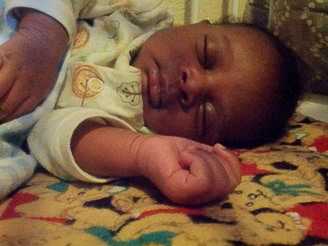 Infants will sleep according to their developmental needs and as outlined by parents. We provide flexible sleep times and establish a regular routine for your child. We have three basic rules in this program: safe bodies, safe feelings, and safe equipment. By providing a play-space with fewer restrictions and rules, we believe that the children are more in control of their environment. It is a place that truly belongs to them. This in turn creates a room full of happy children, happy families and happy Educators. There is an information board outside our room where you will find highlights of your child’s day and any other pertinent information such as supply Educators and allergy or illness alerts. The Educators in the infant room are here because we love working with infants. We love to cuddle them, play with them, rock them to sleep, and help them to express themselves. We enjoy watching them learn – everything is new and exciting for them. We enjoy watching them form friendships with the other children. And we enjoy hearing about their wonderful milestones and their exciting adventures from you. Please feel free to chat with us about your child and to share with us any concerns you might have. 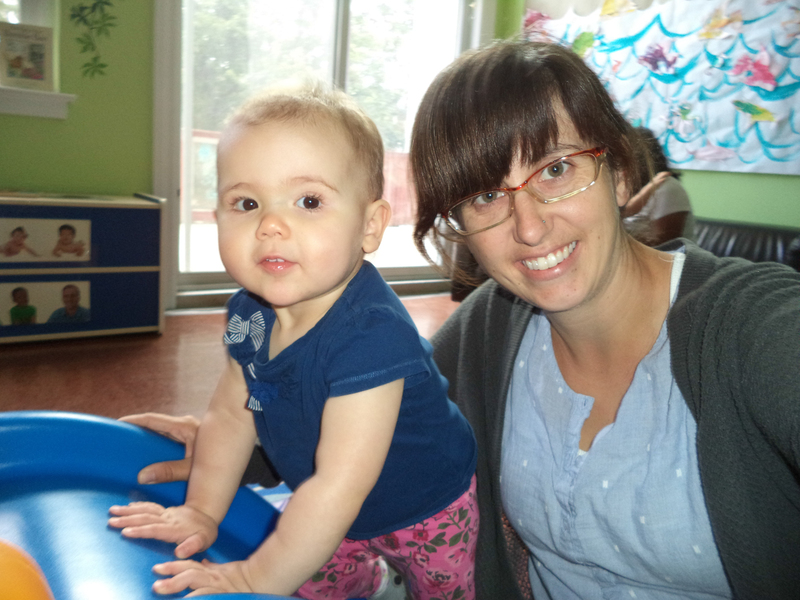 A typical day in the infant room includes morning snack, diaper changes, indoor and outdoor play, lunch, sleep time, afternoon snack and more playtime! When these routines occur depends entirely on the children. Routines provide security for the children but are always flexible as needed. In the infant room, each child sets his or her own schedule. Some children may need two naps a day, while some may only nap in the afternoon. Some may prefer an earlier lunch than others. Some may need more than the regular three diaper changes. We follow your written instructions and observe the children closely to ensure that we are meeting their individual needs. When you first introduce your child to this Program, you are welcome to stay and play until everyone feels comfortable. Some parents choose to make several short introductory visits to ease this transition; however, we recognize that this is not always possible for you. Be assured that we will do everything we can to help your child to feel secure and happy. For some children (and parents!) integration can be a teary time. This is a normal, healthy reaction to being away from mom and/or dad (or your baby!). Once the children come to know and trust us, they are very happy to play with us and with the other infants. 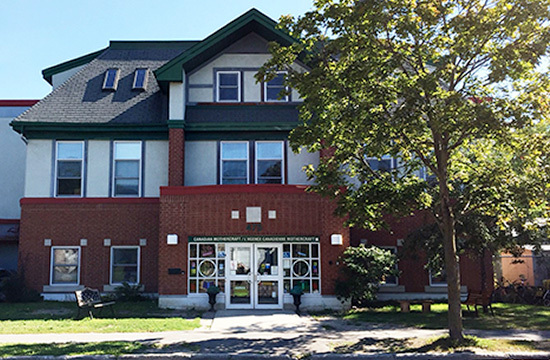 Our door is always open to our parents and you are always welcome to call to see how your child is doing or to drop in for a visit.